Another nice project Gearhead! I like the line drawings, it is so clean. I had one of those cars back in the '70's and it was great fun. Wish I still had it today. My time back is already being monopolized w/ things to do, so will have to see how things develop w/ all the Xmas cheer. Thanks for all the great comments. I have wanted to do a 1600E for a long time. 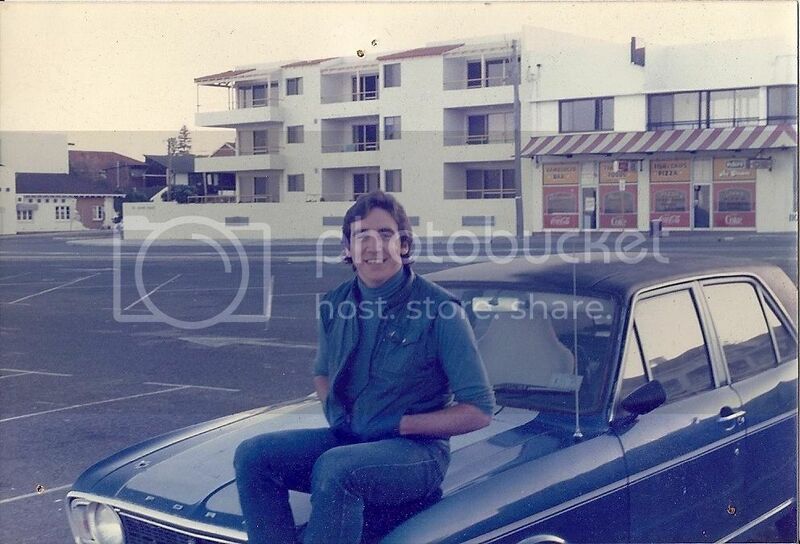 I have attached a picture of me back in the mid-80s on the bonnet (hood to our American friends) of my '71 Cortina GT in Perth, Western Australia (the Aussie GTs were pretty much 1600Es in slightly different guise). Mine was a factory 2-speed (i.e. 1st and 3rd gear did not work) and had a two-tone roof. It is two-tone because it was beige, I wanted it black a la 1600E and I ran out of money / paint. Mind you, the previous owner had put a hood scoop, air dam, spraypainted Firebird and tail spoiler on (w/ pop rivets, no less ) so all that garbage was the first to go. Faux sheepskin is because of no air-con, of course. I consider my mods an improvement. It was a factory metallic blue car however w/ a great engine and noisy diff. I cured the diff noise by putting in a cheap stereo, as I was a student w/ no money. I still think the UK 1600Es look the best - great little cars, would have one again anytime (or a Savage). I'm thinking of attempting this myself - are there any pictures of the finished model? Never did see a finished model, assume its off in the ether hobnobbing with some of my long term unfinished projects. I was hoping to crib a design :-) but really I should design it myself. There was no three door Cortina, that's an Alfa I think.